Jim came to the Academy from Gonzaga University by means of a Congressional appointment. From the very beginning of his four year stay on the banks of the Severn, Jim gained the reputation of being an excellent all-around athlete, but he confined his interest in varsity sports to football. He started as an end on the Plebe football team and continued on up the ladder to the varsity where his aggressiveness and drive were outstanding. In the intramural field, Jim was a standout pitcher for the company softball team, and an able batsman as well. In his last assignment, 1st Lt Barker, USAF, flew reconnaissance F-100s out of Misawa, Japan. He was launched as a single aircraft on 2 Oct 59 to perform reconnaissance in the area of a Soviet military exercise then occurring about 120nm east of Misawa. The last communication from Lt Barker was an "emergency squawk" on his IFF. He was presumed, unofficially, to have been shot down by a Soviet aircraft. At the time of his death, his wife, Mimi was expecting their third child. Three weeks later, in New York, Theresa (Terry) was presented to the world, joining Paul and Meg. Mimi married Jim Flanigan in Aug 61 and resides in Villanova, PA. They now have 7 children between them - 6 daughters and 1 son. Mimi restarted her modeling career with Powers in New York and became a supporter of benefits for "Cold War Widows," working with Sen. Keating, et al. Parts of the above saga became a feature article in the 1 August 1960 issue of Life Magazine. Jim came to the Academy from Gonzaga U. in Spokane, WA. An all-around athlete, his prime athletic talents went on display as an end on the football team coached by Eddie Erdelatz which went on to win the 1955 Sugar Bowl. Beyond his athleticism, Jim was an all-around class act - easy to be with, always upbeat, and one who had gracious acceptance of everything that came his way. He has a memory marker in Arlington National Cemetery. A brass plaque in Dahlgren Hall that honors him is in the upper gallery on the Bancroft Hall side, close to halfway down the gallery by the Utah window. 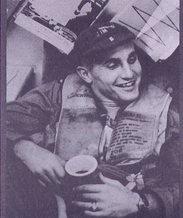 A photo of family members and the plaque is in the November, 1960 Shipmate, p. 61, in the class column. James is one of 26 members of the Class of 1956 on Virtual Memorial Hall. This page was last modified at 16:15 on 8 January 2019.